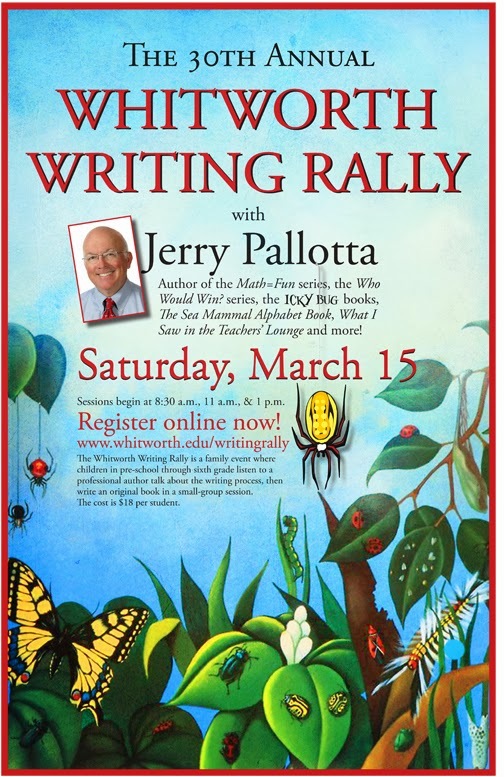 The Whitworth Writing Rally, a family literacy initiative for students in pre-school through sixth grade, will celebrate its 30th anniversary by welcoming to campus author Jerry Pallotta. The rally will take place Saturday, March 15, with sessions beginning at 8:30 a.m., 11 a.m. and 1:30 p.m., in Weyerhaeuser Hall on the Whitworth campus. As many as 400 students from the Inland Northwest are expected to participate this year. The registration fee is $18, which covers a T-shirt, snacks, writing and art supplies, and participation for one child and a parent or adult guardian. To register, visit http://www.whitworth.edu/writingrally/. The deadline for registration is March 6. Pallotta has written a wide range of children’s literature, including The Icky Bug Alphabet Book and The Bird Alphabet Book, which was voted one of the best books of the year by Birders World Magazine. Pallotta’s first book, The Ocean Alphabet Book, became the top bestseller at the New England Aquarium. This will be the last Writing Rally in its current format. Les Francis, the rally’s founder, says that organizers hope to restructure the event to encourage more parent-child interaction. Francis explains that children rarely get four to five hours of quality time with a parent each day. “That time together is what children and parents remember most,” he says. The Whitworth Writing Rally is sponsored by Pemco, Red Lion Hotels, and Kiwanis. Kathryn Picanco, director of the Whitworth Writing Rally, associate professor of education, and director of the Whitworth Center for Gifted Education & Professional Development, Whitworth University, (509) 777-3459 or kpicanco@whitworth.edu.